Probably staving off bankruptcy would be considered a huge victory for next year. Image source: Peabody Energy Corporation. "It can't get any worse than it already has, right?" Anyone who has looked at a price chart for Peabody Energy (NYSE:BTU) or other coal companies has to be thinking this to a certain degree. In 2015, shares of Peabody have declined more than 92% and are down more than 99% since the peak of the commodities boom in 2011. Even with that much bearishness baked into the stock. it's hard to see Peabody's shares making a hard recovery in 2016. Let's take a look at all of the things working against its recovery that could make 2016 just another year of misery for the company. For decades, coal absolutely dominated the U.S. electricity generation space. It was reliable, it was cheap to build and maintain, and few other sources have given it much of a run for its money. In 2001, coal was responsible for more than 50% of all electricity produced. Since that time, though, we have had two major developments. Development of shale gas has made natural gas a cheaper source of electricity, and all renewable sources have carved out a higher share of the electricity generation pie. According to the last report from the U.S. Energy Information Administration, coal's market share has declined to the 30%-33% range. For Peabody, this has translated into an oversupply of coal in the market and a steep decline in coal prices. Since 2011, average coal prices in the U.S. have declined more than 50%. Even worse, the pressure from current natural gas prices suggests that there isn't much room for coal to raise prices without losing even more market share to natural gas or other sources. If dealing with cheap natural gas wasn't hard enough for Peabody, it also has to deal with the pressure of other companies producing too much coal for entirely different reasons. On the one side, we have profitable coal companies like Alliance Resource Partners (NASDAQ:ARLP)that can afford to invest and bring new production on line. In the past five years, the company has remained solidly profitable and has grown production by 33% while Peabody has seen earnings plunge into the red every year since 2012. On the other side of the spectrum, Peabody has to deal with a slew of what you could call zombie mines. These are the assets of bankrupt coal companies that are still producing, possibly at a loss, because either the company needs to pay off its outstanding debts or needs to raise the cash to do all the work to shutter the mine. With the overhang of all this unprofitable production, it continues to put pressure on overall coal prices. 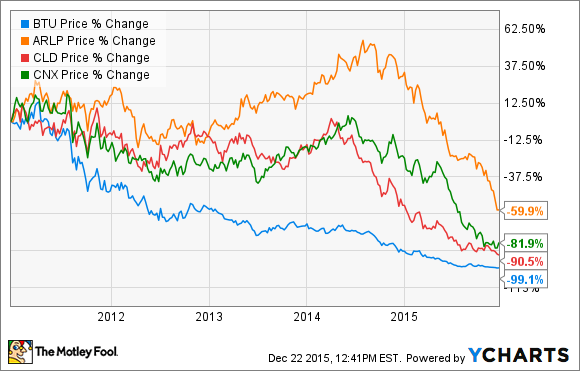 Peabody Energy's finances aren't going to do it any favors in 2016, either. The company currently sports $6.3 billion in debt and a net debt-to-EBITDA ratio of close to 11 times. Only bankrupt Alpha Natural Resources and teetering on bankruptcy Arch Coal (NASDAQOTH:ACIIQ) are in worse financial shape right now. Even if Peabody were to see an improvement in the coal market, it will likely take a while before the company can clear itself of debt issues and generate some positive earnings for its shareholders. As sad as this sounds, just the ability to generate enough money to pay its interest and perhaps pay down a little debt would be a major feat in 2016. Market conditions for coal in general and Peabody's albatross-sized debt load make for a huge obstacle for its management to overcome. In some ways, it appears that the company is trapped in the death throes of debt, and simply coming out of 2016 without going bankrupt would be an accomplishment in and of itself. Any investor looking at Peabody with that "It can't get any lower" mind-set should be aware that, yes, things could get worse for shares in 2016 and the chances of a rapid rebound are a long ways off.